MIL-STD-1629 FMECA Software. Free trial from Relyence. With Relyence Failure Mode Effects & Criticality Analysis (FMECA) software you get an all-in-one package supporting the worldwide-accepted standard for FMECA: MIL-STD-1629A. 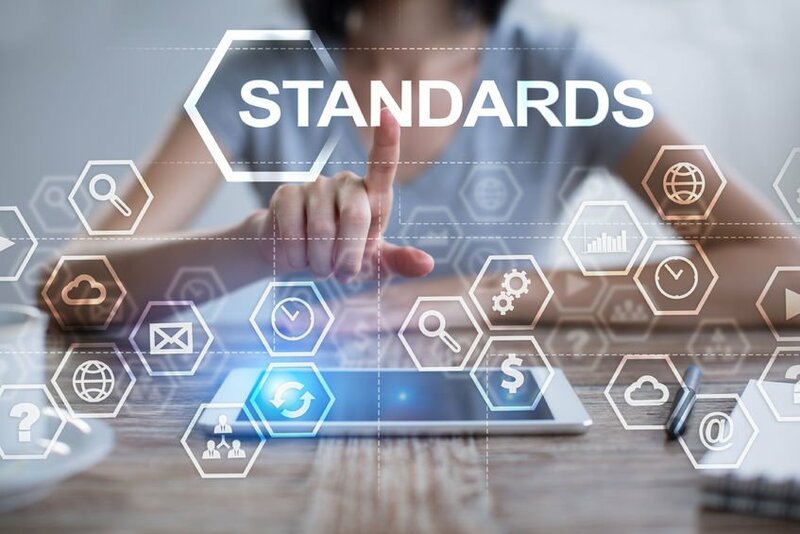 Whether you prefer to adhere strictly to MIL-STD-1629, or want to customize your analyses, Relyence FMECA enables you to work the way you choose and meet your compliance requirements. MIL-STD-1629-based FMECAs can be performed in either a quantitative or qualitative approach. In either case, the core principle remains the same: evaluate and assess all potential system failure modes, the resulting effects and possible causes of those failure modes, and ultimately eliminate, reduce, or mitigate the failures deemed most critical. When using a qualitative approach, a criticality matrix is often employed. The criticality matrix is a visual grid of system failure modes categorized by the probability of occurrence and severity level. 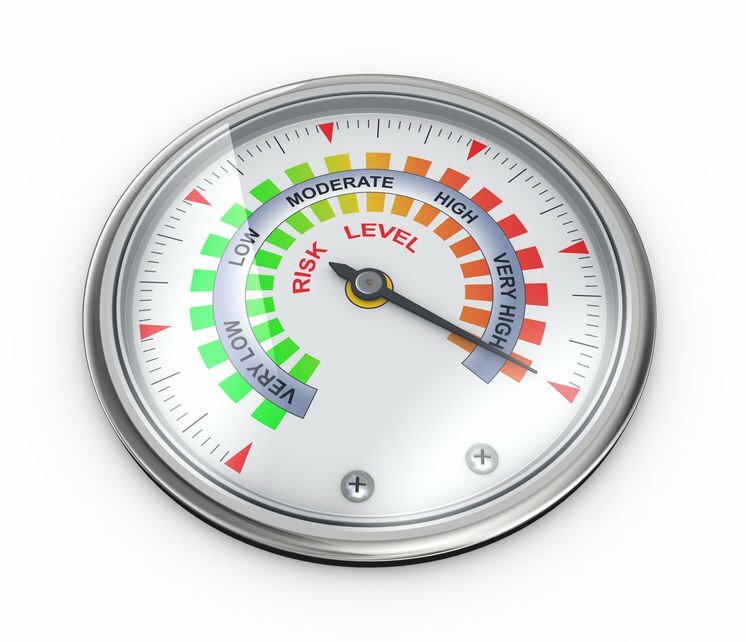 This data can then be used to organize failure modes by overall risk, providing a way to ensure you address your most critical issues first. Using a quantitative approach enables you to determine failure mode criticality and item criticality values. 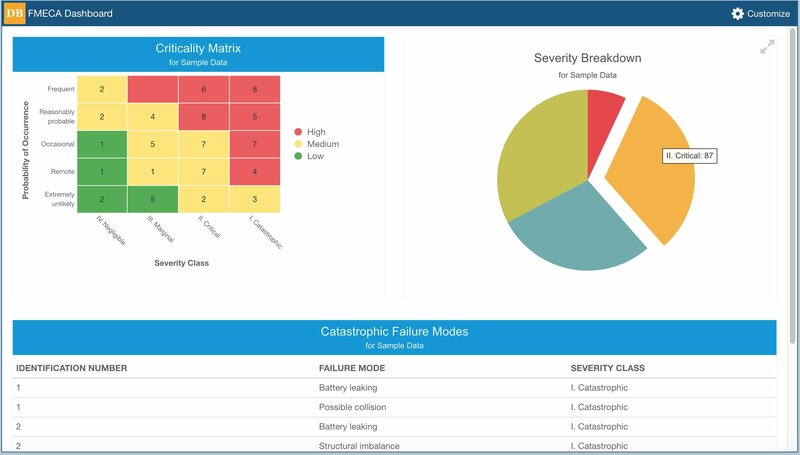 This metrics-based analysis allows you to easily rank failure modes in order to begin the important work of eliminating or mitigating the most critical items. Though not required, MIL-STD-1629 FMECAs can be performed at the piece-part level. In this manner, you determine all the possible failure modes of each individual component in your system, down to the piece-part level. Due to the highly detailed and comprehensive nature of piece-part FMECAs, you can be assured that all potential failure modes are addressed. Relyence FMECA offers several built-in, out-of-the-box Worksheets for your MIL-STD-1629 analyses, as well as single item navigable form views. If you are performing qualitative analyses, you can select the “FMEA” view for your Worksheet. This less complex Worksheet provides the core data fields required for MIL-STD-1629 FMECAs: Function, Failure Mode, Failure Effects (Local, Next, and End), Severity, and other related fields. 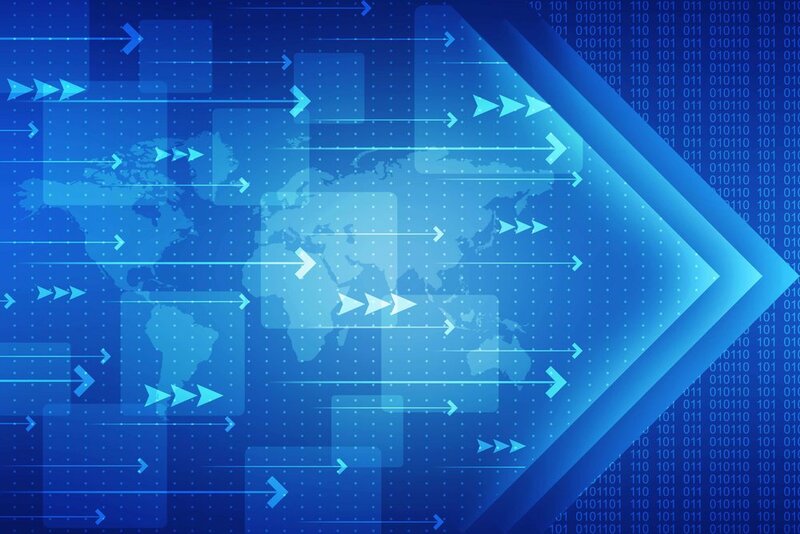 The FMEA view provides the most basic set of data fields needed to perform a complete FMEA, and meets the requirements for MIL-STD-1629A Task 101. When performing quantitative analyses, you can choose between the Criticality Analysis or FMECA Worksheet. These Worksheets add on the measurement data fields required, such as failure mode probability, failure mode percentage, failure mode criticality, and item criticality. The Criticality Worksheet meets the requirements of MIL-STD-1629A Task 102. The FMECA Worksheet includes all data elements found in MIL-STD-1629A, including part failure rates. Additionally, you can customize any of these built-in Worksheets, or even create an entirely new one suited to your needs. You can use one of our supplied Worksheets as a starting point and customize it with a few mouse clicks. Also, you can change and modify your Worksheet layout on-the-fly, at any time with no data loss. Different teams or different team members can use their own Worksheet views while all data is automatically shared. Lastly, no matter what Worksheet view you use, the Relyence FMECA Form views are always available. The Form view allows you to see a single line item in a mobile or small-display friendly way. Navigation buttons enable you to quickly move through the various items in your FMECA Worksheet. In some cases, Relyence FMECA users prefer the Form view over the Worksheet view. Or you can use both – with a simple mouse click you can switch between the Form view and Worksheet view at any time. The choice is yours! Relyence FMECA combines all the elements needed to support full MIL-STD-1629A FMECAs along with an array of features and functions to make your job easier than ever before. 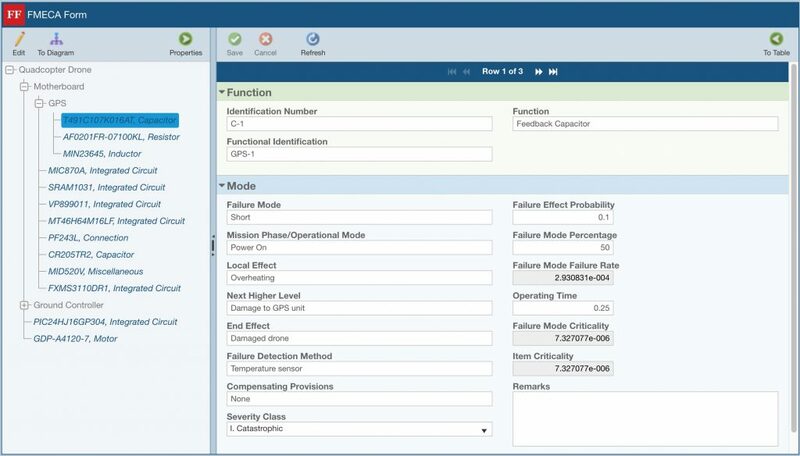 Relyence FMECA integrates seamlessly with Relyence Reliability Prediction so failure rates needed to perform criticality calculations are automatically retrieved. As with all Relyence products, Relyence FMECA can be part of the Relyence Studio framework to combine any or all reliability analysis tools in one integrated package: FMECA, FRACAS (Failure Reporting, Analysis, and Corrective Action System), Fault Tree, Reliability Prediction, RBD (Reliability Block Diagram), Maintainability Prediction, and Weibull Analysis. Our always-in-syncTM feature which keeps all your elements of your FMECA process in sync and organized at all times. Support for the Knowledge BankTM which enables you to capture your lessons learned for reusable and automated FMECAs. Full Dashboards for a visually impactful, at-a-glance overview, and insight into your most important FMECA metrics. Built-in FMD-2016 (Failure Modes Distributions) database for automated retrieval of electromechanical component failure modes. Browser-based design for no-installation ease of access across the globe. Mobile-friendly design for device independence and wide-reaching accessibility. These features, along with a host of others, make Relyence FMECA the tool of choice for analysts in a broad range of industries across the world. The user interface with color-coded fully featured Worksheets are far more comprehensive and intuitive for FMECA work. The availability of a form-based interface for single line item expansion cannot be duplicated in Excel. Built-in calculations for criticality metrics, especially those linked to Reliability Prediction failure rates, are difficult, and in some cases, not feasible to implement in Excel. The support for a Knowledge Bank for FMECA data reusability is unmatched in Excel. Text-based phrases and searching capabilities in Relyence FMECA keep FMECAs consistent and accurate. Built-in support for FMD-2016 enables fast FMECA data entry and builds a solid foundation on which to start your FMECA tasks. Available on the cloud for team centered collaboration, device independence, global access, and data sharing. Importing and exporting functions supported. Customizable dashboards for task management and insight into critical metrics. Sign up today for your free FMECA software trial and see the power of Relyence FMECA in action! Or feel free to contact us to schedule a free interactive webinar to view Relyence FMECA, ask questions, or get advice on how Relyence FMECA can work for you. Also, feel free to contact us at any time for questions, concerns, insights, or advice. Our Relyence team is proud of our long track record and experience with failure mode, effects & criticality analyses. We are happy to help!